Fun Ways to Use Scrap Yarn! If you are anything like me, you hate to throw out perfectly good yarn just because you only have a few yards left over from a project. I know there's a fine line between hoarder and frugal. My husband would probably put me in the first category, which is why he stays out of my studio (unless it's tidy and he's invited!). I hate waste, so I've been on the hunt for creative ways to use up my yarn scraps and even to end up with some fun gifts to give! 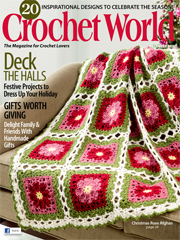 My favorite project is the simple afghan pictured below. I think I've been working on it now for two or three years. 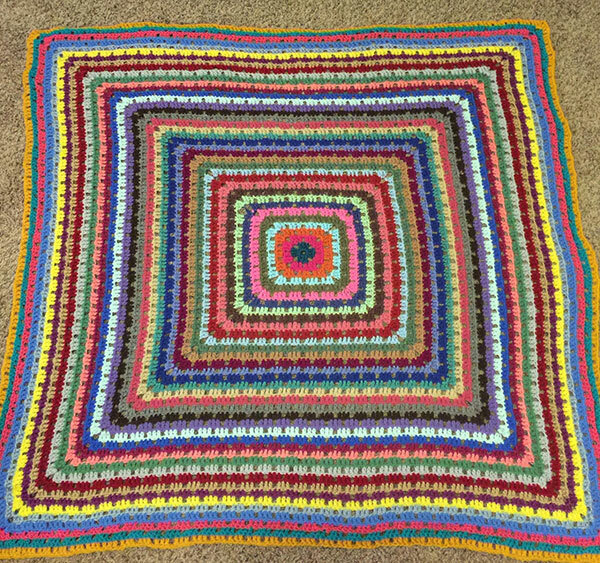 My only rules are that I only add a round if I have enough yarn to complete just one round, and that there are no same-yarn or same-color repeats. It's a challenge I gave myself so I could play more with color without worrying about what the next color should be. The length of the scrap determines the next color! I admit I really hated it to begin with, but I forced myself to keep going. Now, I really look forward to each new addition. I'm not sure when I'll decide it's done, but I'm certain I have at least one more year of crocheting left on it. Crochet flowers are a fun and easy way to use up smaller amounts of yarn. Contrasting flowers on handmade items are finishes that knock the "wow!" factor up several notches! Plus, they are fast and easy projects. They are great to have on hand because you never know when you might need them. You can use them on pillows, purses, cardigans, or really wherever placing them makes you happy! Small motifs are exciting too! 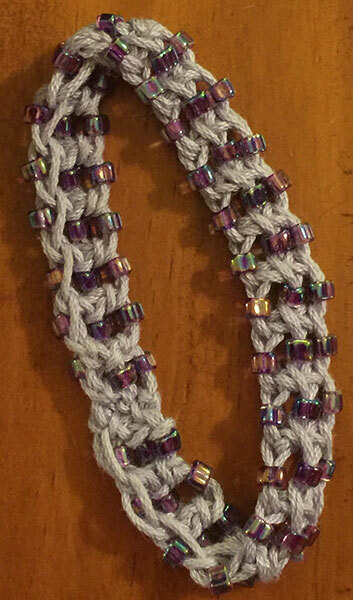 Each round or row can be a new color, and connecting them as you go makes for a very nice finished project. After I finish my afghan in the round, this will be my next use of scraps. I love color, and I've learned so much from the afghan I'm making now that I can't wait to do one that has some different challenges! Hair scrunchies are a really practical way to use your scrap stash! 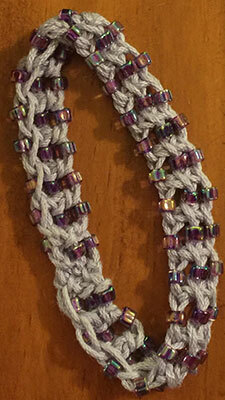 I also enjoy using pony beads with mine. 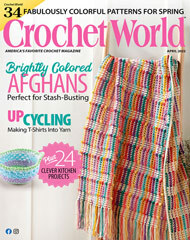 To make them, you simply crochet your favorite stitch over an elastic hair ring. For those of us with really curly hair these babies are lifesavers! Smaller bands rip my hair out but scrunchies don't. I need slick yarns that my curls can't grab onto as well. Being able to create your own scrunchies, in colors and fibers that work well for your own hair type, is priceless! Chaining long chains and then turning back and slip-stitching through the chains makes sturdy and unique ribbons for gifts. You can make same- or complementary-color pompoms for gift-wrap toppers or use them in place of bows. My husband's nanny used to make tiny bells, hats, socks or flowers for her gifts with her leftovers. They are sweet keepsakes we really cherish. 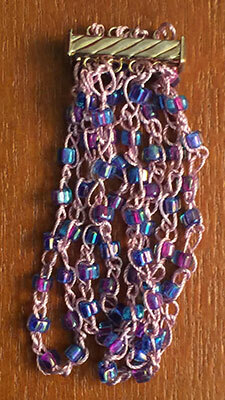 Bracelets or necklaces are also a lot of fun to make with scraps. 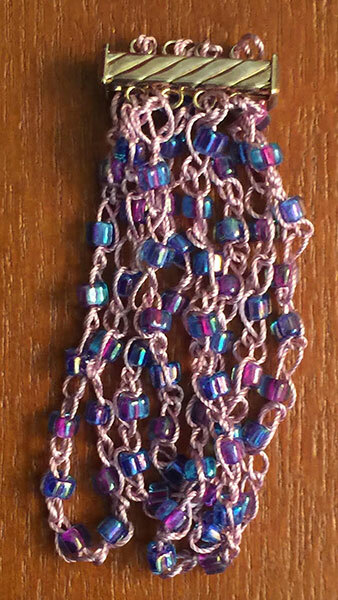 I love adding beads to the stitches to bring some bling to the design. You can easily add charms to your jewelry too. 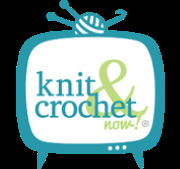 Play with different stitches and colors to find which ones are your favorites. I love using Tunisian crochet and cotton for bracelets because the resulting fabric is much firmer than regular crochet. The closure on your jewelry doesn't have to be fancy -- a simple knot works! It's very handy that they can be washed because I tend to spill on them or get them wet pretty easily. Coasters are also an awesome way to use the very smallest of scraps. Pick a pretty motif and make each round a different color! You can never have too many coasters, and they are easy to wash if they get dirty. Just be sure to choose a smooth stitch so your drinks don't tip over! I hope my ideas have inspired you to use up those scraps! I'd love to hear from you -- what are your favorite ways to use leftovers?